The 30 Gallon Spill Kit is perfect for warehouse or loading dock. A spill can happen any time or any where. 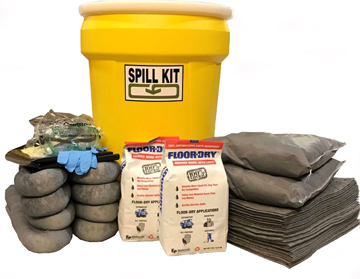 The newly redesigned 30 Gallon Spill Kit has everything you need to effectively clean up a spill at your facility. Place it strategically close to where a spill is likely to occur - around machinery, near the loading dock, or on a shop truck. The Yellow 30 Gallon Open Head Drum is durable, lightweight, weather and chemical resistant with UV inhibitors. Lid Closure is easy to open Plastic Lever-Lock. Choose Oil Only or Universal. A refill spill kit is available.